So then, ‘The Troika’ – a group of unelected, unaccountable, fantastically well-paid and cosseted bureaucrats and bankers – is now dictating, literally dictating, how once-sovereign societies are to live their lives; even down to how much money a citizen can draw from his bank account each day. And if anybody argues that these capital controls are temporary, then they’re probably on the dictatorship’s payroll. For how much longer will the ordinary people of the Evil Empire European Union put up with this? What sickens me is the deafening silence from the British political class; if our politicos say anything at all, they condone the actions of ‘The Troika’. It’s utterly shameful, but moreover it makes me ask “Why? Why are our politicians backing the economic crushing of sovereign states in this way?”. Furthermore, the situation in the UK, in terms of public understanding and opinion of all this is, as always, exacerbated by the pernicious effects of the BBC’s love affair with the European Union and the euro currency. The BBC just cannot get its head around what’s happening in Europe. The BBC cannot comprehend the profound nature of the outright socio-economic warfare that European politico-banking and politico-bureaucratic elites are now waging on the peoples of Europe, on their ‘own’ (ha!) people. Nigel Farage needs to step in to the nearest telephone booth and pull his underpants over his trousers pretty quickly as far as I can tell. PS By the way, in none of my comments on British and European politics have I ever shouted ‘Vote UKIP!’ However, my view of UKIP is that, right now, we need someone, anyone, to challenge, to embarrass, to frustrate, to unsettle, to upturn, to spike the British political status quo. And to do all of that to the unmitigated madness that is the European Union at the same time. I can’t see any politician or political party, apart from Farage/UKIP, in a position to break the appalling, complacent, homogenous, deadlock that now characterises British politics and so locks us in to the grotesque unfolding of events within the European Union. So, whilst I support the Farage/UKIP anarchy, I’m under no illusions about the fundamental, long-term strengths and weaknesses of Farage/UKIP. However, unless somebody stirs things up in Westminster and Brussels, and fast, then we really are on the road to serfdom. And is Nigel Farage to be the new Oswald Moseley? Yes p-g, I also strain to find historical analogies and precedents to the situation in which we find ourselves today. Whilst I have not set out to look hard for precedents, I have read articles and books which purport to set today’s global economic events in to an historical perspective. For what it’s worth, I judge from the evidence available that our current situation/predicament is all but unprecedented, absent total warfare between nation states. In that sense, I believe that we live in very uncertain times indeed. If we think events in Cyprus are special or different because Cyprus is “small”, then we may need to think again. In short, I think we’re witnessing the unfolding of totalitarianism without bombs and guns (thus far). If the European political elites (and all their hangers-on) carry on as they are, then the continent of Europe will implode within a generation, but quite possibly much sooner than that. As for the US, goodness knows where they’re heading … for me, it’s enough just to keep a close eye on Europe. Others, however, are arguing that the US will go off the rails in the fullness of time. Debt, debt, debt, debt, debt, coupled with little/no prospect of generating economic growth at the rate needed to deal with that debt, debt, debt, debt, debt … will force events. Interesting that you mention the US. I agree that the situation in the world is unprecedented as far as we can tell. since never before has so much debt been incurred nor (to my knowledge) has more or less everyone been following the same types of policy and fallen into exactly the same hole. However, I have been thinking about the US. There’s no doubt in my mind that they will come close to disaster, but at that point they will be able to recover much more easily and strongly than the European nations. I believe that under the pressure of events they will come to their senses and begin to utilise their immense advantages re energy, manufacturing capability (needs re-building of course) and sheer economic size. I would liken it to the military situation just after Pearl Harbour. Can’t see a similar prospect for any other major nation frankly. The Beeb will not criticise the EU as it apparently is the recipient of much dosh therefrom. Anyone see that ghastly Emily No-mates take Nige on the other night? Missed it myself. When the time for action arrives the time for ranting is over ,thank the Lord.So little time ,so little community preparedness.Twas ever thus.Where is there a prepper Baden Powell to get us prepared? Any volunteers? I may be wrong but it seems that former members of the EU Politburo continue to receive continued, considerable payments as long as they support the “party” line. So if a former member of the Politburo then, say, is made the chairman of a State broadcasting system and then arranges a loan for that organisation then the strings from Brussels are automatically attached to ensure that the “party” is shown in a good light. Furthermore, if another former commissioner leaves his post on the Politburo and ends up in an influential position in a State’s government, say, a deputy Prime Minister then he would naturally feel it incumbent on himself to continue to promote the Brussels “party” line to ensure his continued drip of gold to keep his family in a way they have become accustomed. Of course, this appalling situation could not happen in the UK would it? Well, certainly not without others aspiring to earn such fabulous wealth from an unaudited source, free from the prospect of legal prosecution. Goodness knows what such underhand and corrupt practices could do to a small, southern European state! MM your comments are very similar to my own, so I’m in full agreement. I do though begin to see some light at the end of the tunnel, in that people are now far more sceptical about the utterings of our politicians. Over the last year or so the comments about UKIP and Nigel, which once used to be muted and minor are now being seen consistently. People have begun to realise (at last!) that most of what he says rings true. He is showing up our politicians as out right liars who are only adept at missing out the true information. I look at Cameron’s comments yesterday about controlling immigration, it was destroyed in just a couple of hours! UKIP have a good chance of changing the political situation in this country for the good. I fully agree with you that they might not be all that we want in the future. As with all young things (people/businesses/countries/parties) there is a learning curve to go through. It is utterly ridiculous when a state broadcaster becomes an off shore propaganda wing and I like most am constantly unsettled by the fanatical antics particularly in this time of crisis. 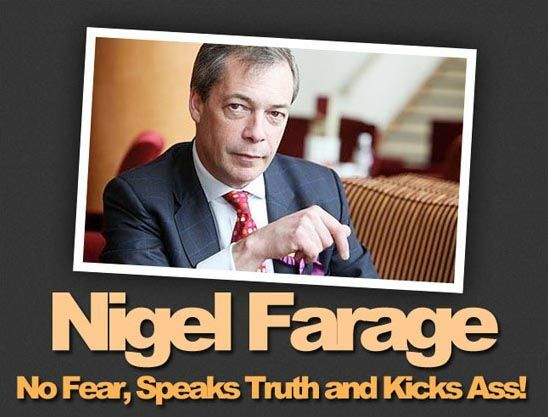 Farage and UKIP… bless him, our one and only superman facing an onslaught of bias and prejudice while the theft and political realignment continues apace. You have to feel for ordinary Greek people… truly appalling times. Good post. I am in complete agreement. My rage is rising by the day. As I say to anyone who will listen, ‘this is going to get really ugly’. If it wasn’t for the seriousness of what has happened in Cyprus (which to me is cataclysmic for the banking system just shows how scared they are if the derivatives timebomb to go to the extreme of confiscating depositors, sorry now ‘investors’, money) I am actually enjoying watching the BBC squirm as they try to paint the EU in a positive light, which is impossible of course. Yes Sam I acknowledge that I edged rather close to ranting in that one! However, the situation in Cyprus at the moment is testing my patience. So, God knows what it’s doing to the Cypriots? Don’t apologise – I agree with it all. A couple of years ago I was wary of the conspiracy stuff and tin foil hat wearers. The sad thing is that now, you can write a post like yours and we can actually believe it all. If you reflect, we have travelled a long way down a dark road in just 3 years.